Let's add the ability for users to like products. This way, users can keep track of products they may be interested in buying later. To set this up, we need to keep track of all the products a user likes. How can we store this information in the database? To keep track of all the products in a category, we just added a category_id to products. In this case, we could we add a user_id to products which will be used to record the user that likes a given product. We need a way to track all the likes between products and users. Each user can like many products and each product can be liked by many users. This is called a many-to-many relationship. Instead of adding a single column to one model, we should create a new model to represent this relationship between users and products. Let's create a new model called Like to keep track of all the likes. What custom columns should we put in likes? We just need two: product_id and user_id. Each like item will store the id of the liking user and the id the liked product. To get all the products liked by a user #1, the computer will get all the Likes where user_id is 1, and then it can use the accompanying product_id's to get all the liked products. In the above diagram, User #1 liked 3 products, with ID's 1,3, and 4. Go ahead and generate the model Like. After entering the above code, Rails will create a new Like model and migration file. 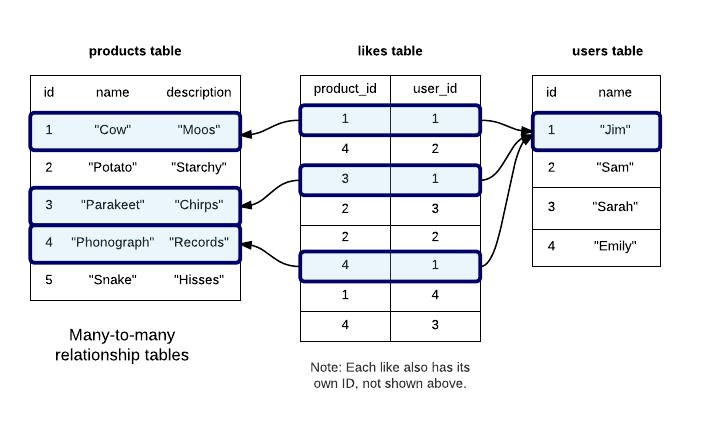 Usually, we would run rake db:migrate now to create the Likes database table, but let's first make some changes to the migration file. How does the computer get all the likes for a specific user_id? By default, the computer simply goes through all the likes from beginning to end and pulls out the ones with the specified user_id. This is fine for a small site, but can get slow when there are millions of likes. To speed things up, you should add an index to columns that get looked up a lot. An index takes up some space, but it lets the database look up items much more quickly. You can tell Rails to create a database index for you by using the add_index method in the migration file.